Several recent accidents were caused in Missouri by icy roadways. Venturing out and driving in the winter always necessitates extra time and extra caution. However, a little snow is generally more manageable than ice and losing control of a vehicle on slippery Missouri roadways can be serious. Recently, on a Friday evening a woman from Bonne Terre was driving on Highway 47, which was slick with ice, when she lost control of her vehicle at the intersection of Highway 47 and Old Cadet Road and ended up crashing into a tree. Elizabeth Markham, 45, was rushed by ambulance to Parkland Hospital for treatment of serious injuries after the accident at 9:05 p.m. According to the Missouri State Highway Patrol, Markham was wearing her seatbelt when the crash happened and her injuries were considered serious. Her vehicle was badly damaged. Another accident on Highway 47, also due to dangerously icy road conditions, happened near Old Bonne Terre Road. The Missouri State Highway Patrol reports that Melissa A. Missey, 41, of Cadet, Missouri, was heading northbound near Old Bonne Terre Road on Highway 47 when she completely lost control of the 1997 Ford Mustang she was driving. The accident occurred at 8:30 p.m. After Missey lost control of the Mustang the vehicle left the roadway and overturned. Missey sustained minor injuries and was transported by ambulance to Washington County Hospital for treatment. The Mustang was totaled but the fact that Missey sustained only minor injuries could, in part, be attributed to the fact that she was wearing her seatbelt at the time of the accident. Anothrer Friday night accident on Highway 47 near Kingston Road in Washington County left two Potosi residents injured. Again, the accident was caused by the icy roadway. The Missouri State Highway Patrol reports that Stephanie M. Reinken, 54, was driving a pickup truck, heading north on Highway 47 near Kingston Road, when she lost control. The accident occurred at 10:10 p.m. The 2002 Ford F-150 Reinken was driving went off the left side of the road and hit multiple trees. Stephanie Reinken and her passenger, John D. Reinken, 49, both sustained minor injuries in the accident and were taken by ambulance to Washington County Memorial Hospital. The crash report states that neither occupant was wearing a seatbelt. 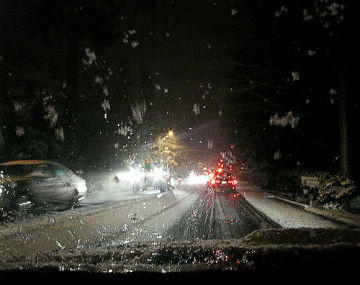 Driving conditions can be tenuous and even a simple journey or a quick trip can be made hazardous by icy roadways. Driving slowly and always wearing a seatbelt is important. It is also important to get in touch with a car accident attorney as soon as an accident happens. Car accident attorneys understand your rights and will work to protect them, regardless of whose fault an accident was. You may be entitled to compensation for injuries sustained in an accident, and discussing your case with a car accident attorney as soon as possible is an important step in moving forward and getting the compensation you deserve.